There are many local Christmas events that happen around the local communities and cities in the metro-Orlando area with some of the bigger events offering a great experience at a great value. There are also many things to do to celebrate Christmas in Orlando that are free. We will break out our list into the categories of best overall Christmas Events that cost money in Orlando and Christmas Events in Orlando that are free to attend. 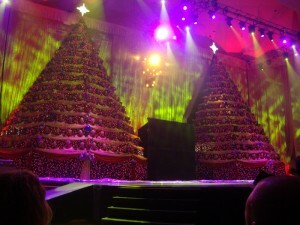 One of the best local Christmas events to attend in Orlando is the Singing Christmas Trees at the First Baptist Church of Orlando that takes place over the first two weekends in December with multiple showings that features a full choir of two Christmas trees with dancing lights, a full orchestra, and a theatrical performance. The Orlando Shakespeare Theater will be presenting “Peter and the Starcatcher” throughout the entire month of December in 2015. During the week of Thanksgiving, the Orlando Philharmonic Orchestra presents their Home for the Holidays Concert at the Bob Carr Performing Arts Center that features a great musical start of the Christmas season. The traveling Trans-Siberian Orchestra also makes an annual stop in Orlando in the month of December at the Amway Center that features a heavy-metal Christmas performance complete with lasers and a lot of pyrotechnics. Leading up to the week of Christmas is the Orlando Ballet’s performance of the Nutcracker that features a full-featured show and a family show. If you are looking to get a little exercise during the holiday season, there are a few 5k’s to participate in that includes a half marathon with the Turkey Trot 5k on Thanksgiving Day in Downtown Orlando, the Reindeer Run 5k at SeaWorld, the Jingle Bell Run 5k at Baldwin Park, and the OUC Half Marathon and 5k in Downtown Orlando. For sports enthusiast, the Russell Athletic Bowl and Capital One Bowl are played at the Citrus Bowl in Downtown Orlando around New Years Eve and Day. Some of the best Christmas Events in Orlando are free to attend that features orchestra’s, Christmas Lights, ice skating, outdoor movies, and parades with many of the events taking place in Downtown Orlando, the city of Winter Park, and UCF. Both Downtown Winter Park and UCF have outdoor ice skating rinks throughout the holiday season that is available during the special events taking place throughout the months of November and December with the UCF ice skating one of the attractions of Light Up UCF that features outdoor holiday movies, carnival rides, and a Christmas Lights Show at the CFE Arena on campus. Some of the great free Christmas events in Winter Park include Christmas in the Park that features the 150-voice Bach Festival Choir, Children’s Choir, and Brass Ensemble and the annual lighting of century-old Tiffany windows from the Charles Hosmer Morse Museum of Art. Other great Christmas events in Winter Park include the Holiday Tree Lighting with free holiday movies, the Ye Olde Hometown Christmas Parade that is the largest and best local Christmas Parade in Orlando, the Winter Park Boat Parade and Festival of Lights that features Christmas Lights on Boats in the Winter Park Chain of Lakes, the Baldwin Park Festival of Lights Parade that is a night parade in Baldwin Park, and Russell Athletic Bowl Parade of Bands that features the marching bands and cheerleaders from the participants of the Russell Athletic Bowl. Winter Park also has great shopping options featuring national brands like Williams-Sonoma, Pottery Barn, Restoration Hardware, and the Gap and many local upscale boutique shops and restaurants that make for a great day or evening. On every Friday night in the month of December and on Christmas Eve, the Charles Hosmer Morse Museum of Art has free admission from 4pm until 8pm at the end of Park Avenue where all of the shops and restaurants reside. Downtown Orlando has many Christmas Events in Orlando and typically features a couple of great concerts at the Amway Center in the month of December (no shows for 2015) and Orlando Magic games that will feature Dwight Howard and James Harden of the Houston Rockets on December 23rd, 2015 and Dwayne Wade and the Miami Heat on December 26th, 2015. Christmas Events in Downtown Orlando include Holiday Lights Orlando Featuring the Gift Christmas Festival and Show that features the lighting of the Christmas Tree and a performance from a choir and orchestra that has been led by in years past by the Composer/Conductor Emeritus of the Walt Disney World Candlelight Procession Derric Johnson. Holiday at Heritage Square features the lighting of the Orange County History Center with singing by a local children’s choir, free admission to the History Center and visits by Santa Claus. Towards the early part of December, the Messiah Choral Society presents a free and elaborate performance of Handel’s Messiah at the Bob Carr Performing Arts Center. On one night in the Month of December, the Russian Ballet of Orlando will present a free performance of the Nutcracker at the Lake Eola Amphitheater that is a great family event. The Florida Citrus Parade is a nationally televised parade that features citrus floats, parade units from Orlando’s theme parks, marching bands and cheerleaders from the participating schools in the Buffalo Wild Wings Cirus Bowl. Downtown Orlando is also a great place to attend Christmas Eve Services with some of the older and more established Churches making their home here including First Presbyterian Church of Orlando. Other highlights during the Christmas season take place in the city of Celebration that is located across I-4 from Disney World with many holiday events, ice skating, and nightly snowfall. Waterford Lakes in East Orlando has a full carnival in the month of December called Waterford Lakes Santa’s Winter Wonderland Village Carnival. Bass Pro Shop on International Drive has a lot of great Christmas activities in the month of December for children. During the week of Christmas, the Central Florida Ballet presents the Nutcracker at the Orange County Convention Center. If you are visiting Orlando in early November, the Mall at Millenia has a great event to celebrate Santa’s arrival at the mall. During the middle of November, the Orlando Museum of Art has decked-out Christmas Trees on display for their Festival of Trees event that are available for purchase for the holidays. One of the best experiences with your family during the week leading up to Christmas is getting in your car and driving around the neighborhoods to view some of the great Christmas Lights Displays to be seen on the homes of the residents of Orlando.